As the dog days of summer finally come to an end, it’s important to remember that in autumn the days with your dog are only getting better. Once you’ve toured the local parks and gotten the perfect photo of your dog bursting through the leaf pile in the backyard, what’s next? Pour your four-legged bud a bowl of high-quality Nature’s Recipe® dog food because we’ve gathered some great spots around the country to get active and make the most of the season with your four-legged friend. Great day hikes are plentiful around Seattle, so why not make a hike specifically to show your best bud some majestic waterfalls? Little Mashel Falls is about an hour and a half from Seattle, but it offers two very excellent experiences for you and your dog. The first is a lagoon at the base of the lower falls -- a great place for your pup to pop in if the weather isn’t too chilly. Even more exciting is a trail that boasts a passage behind one of the falls -- definitely a prime photo op and a worthy adventure for both of you. Just under an hour and a half outside Manhattan, Masker Orchards feels like a whole other world compared to the city. Autumnal colors abound among their trees and gardens, and there are over 200 acres for you and your dog to explore together. Most of the orchard was planted by hand, and some of the 20,000 trees are over 100 years old. If you have a favorite type of apple, then Masker provides a helpful calendar so you can time your visit with Fido to happen right as your personal pick is ripest. 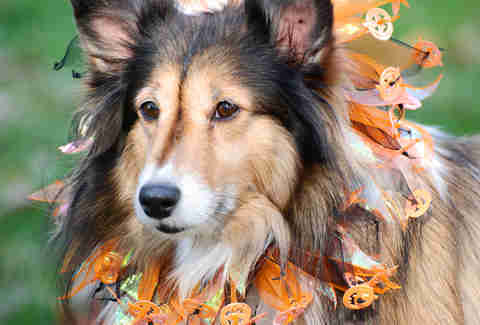 Stroll through their pumpkin patch to give your dog’s sniffer a workout... then feed him the delicious taste of pumpkin when you get home, with an invigorating bowl of Nature's Recipe® Grain-Free Chicken, Sweet Potato & Pumpkin Dry Dog Food. At over 600 acres, there is a simply astonishing amount of Ravenswood Park to explore, and it will all be in the throes of a New England autumn, complete with a name out of Poe or Lovecraft. A fully dog-friendly network of old carriage roads and woodland trails, this park has hemlocks, a variety of wild fauna, and some simply amazing views. If you and your companion are in the mood to live out a fairytale, you can tackle the Hermit’s Haven Quest -- a series of riddles and physical locations throughout the park that ultimately lead to a treasure. A dog solving mysteries? Who would believe such a thing? Give him Nature’s Recipe® dog food to fuel his investigation. The taste will get his tail wagging, while the healthy ingredients will help keep him living a vibrant life. 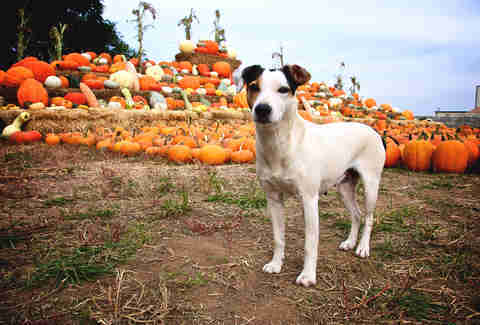 A great family fun spot, Konow’s Corn Maze is a fully dog-friendly farm full of fun activities. The two corn mazes are the main event -- their mini-maze that’s good for a quick stroll, but also a 3.4-mile mega-maize maze that’s made for the true aficionado. 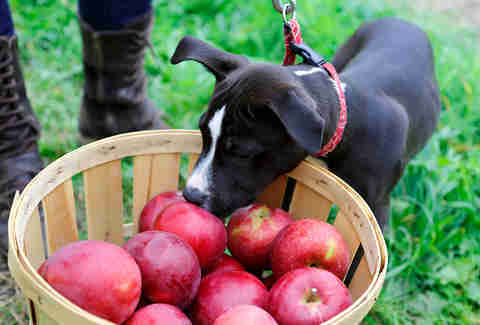 Your pup could come in handy if you get lost -- just have him get the scent of the fresh-made doughnuts and cider at the food station and you should be on the right path in no time. And if your terrier thinks he’s having a bad hair day, just wait until he sees a llama for the first time in the barn’s fenced petting zoo. At the end of the day, hop on one of their free hayrides, relax, and enjoy a little scenery together. When you get home, replenish the energy burned by all that tail-wagging when you serve him a bowl of Nature’s Recipe® dog food. It’s chock full of purposeful ingredients that will help him lead a healthier life -- because dogs should play in corn, not eat it. A dachshund at Oktoberfest might sound like the setup for a bad joke, but it’s just part of the festivities at Nashville’s annual celebration. While the traditional German festival is better known for its wiener sausages than actual wiener dogs, Nashville can have it both ways at Dogtoberfest. On Sunday of the city’s annual Oktoberfest celebration, Dachshund or Dachshund mix owners can register their pet in a competitive race to win the gold. Yeaaahhh, wiener dog races! Not a Dachshund or Dachshund mutt? No problem. 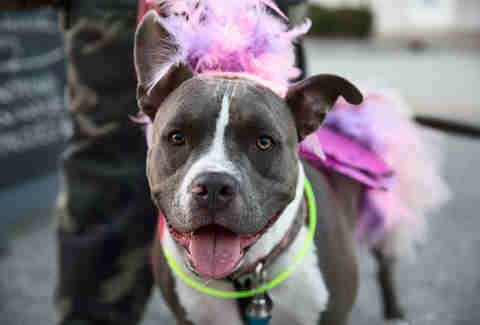 Other dogs can strut their stuff on the Pup Parade, a costume show for all breeds -- although German shepherds definitely have the inside track here. For those who had a soft spot for Disney’s spooky Horrortown, the town of St. Helens has you more than covered. Claiming fame as the filming site for the movie, St. Helens takes each Halloween as an opportunity to get back into The Spirit of Halloweentown again. The entire town transforms into a haunted wonderland for the month of October, so you and the puppers can take spooky strolls through town, watch unnaturally talented variety shows, and even watch a 5k where entrants are “inspired” by zombie pace-setters! (Race organizers have asked entrants to not participate with their dog for safety reasons, lest your dog do too good a job protecting you from would-be zombie attackers.) But with several decorated trails throughout the town and outlying area, there’s plenty of non-zombie-infested exploring for the two of you to do! Plus, if you’re into costumes, enter your bud into the Four Legged Friends Costume Contest on October 15th and see if they can take home the prize for Funniest, Scariest, or Most Original outfit. Denver might not have the gorgeous leaves of a northeastern state, but there’s plenty of colorful sights to be seen when you look up in Chatfield State Park just south of the city. That’s because on any given day, hot air balloons will be criss-crossing the skies over the park. Typical elevation is 1,200 to 3,000 feet, so you can be one of the joyous few whose nickname for Denver is "The Mile High (but I'm A Quarter Mile Higher) City." There have been sightings of private owners taking their pets along for the ride, so if you can’t find a public operator who will, you’re going to want to make friends with a local balloon-owner. If that doesn’t work, the park is also home to some fantastic peaks and valleys covered in various tree life, making for a gorgeous hike for the two of you. 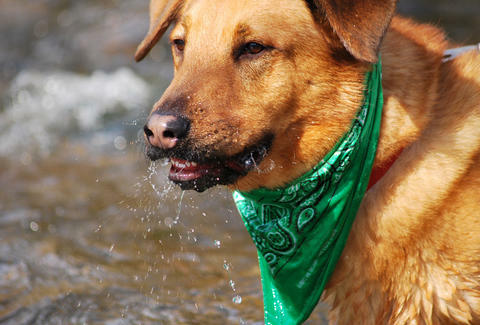 Unwind for a day outside the city with your best friend while the two of you spend a day at the shore care of Discover Outdoors’ “Dog, Beach & Vine” adventure! This trip shuttles you and your dog out for a lovely day on Long Island, complete with legal off-leash playtime on the beach! 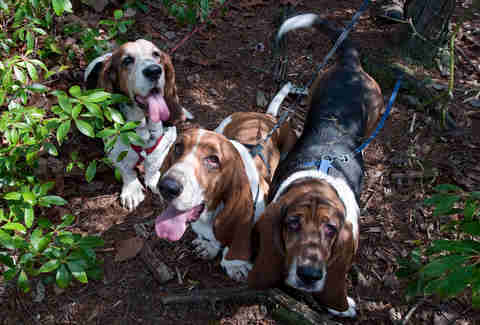 You’ll also get to visit two picturesque wineries, both of which are dog-friendly! It’s the perfect chance to spend a day adventuring while also getting you some much-needed relaxation. Sure, you already did the wine outing of Dog, Beach & Vine, but that was on the east coast. Now you’re out west and looking for a fun bit of exercise before a well-earned glass as you take in the sunset and softly scratch behind your dog’s ears. Get the best of both worlds with the Oakland Wine Trail -- a network of tasting rooms that are connected by a hiking- and biking-friendly path that’s great for dogs to explore while the two of you burn some calories. And if wine isn’t quite your spirit of choice, fear not -- the Oakland Ale Trail also keeps several of their stops kosher for doggies, so that your best pal is included in the social element when you rest your bones with a drink after all that movement. The Van Cortlandt Park dog run is already a great place to stretch your paws in the city, but now you can do it with style. Mark your calendars for October 29th from noon to 2pm because the annual Howl-o-Ween costume contest pits pup on pup in a cute and creative cosplay contest for all comers. So even if your pup hasn't learned to play dead, he can play undead. Our tip -- make sure your best bud is mobile enough in their costume to make the most of the run. (Even if they happen to look a little out of the ordinary…) It’s the most adorable costume contest you’re going to see that doesn’t require you to hand out candy. But that doesn’t mean you can’t give your cute little canines a treat: They’ll love the taste of Nature’s Recipe® dog food, and you’ll love the natural ingredients with added vitamins, minerals, and nutrients. Don't stop yet! There are a lot more autumnal adventures out there waiting to be found -- and they get even better when you and your best four-legged buddy discover them together. Fuel up for fun by giving him a bowl of Nature's Recipe® dog food first, and see how far the joy of exploration takes the two of you.